Late summer 1983 and six friends, on the cusp of adulthood, go camping in the forest. Star pupils, this is their last chance for a blow-out before they enter the realms of real life. Aurora Jackson is fourteen, and feels privileged to have been invited along – something that everyone except Aurora’s older sister, Topaz, seems to be happy about. After a night of drinking and snorting, the friends awake to discover that Aurora has disappeared. It takes thirty years for her body to be found. DCI Jonah Sheens knows whose body it is before forensics formally identify her – the disappearance of Aurora Jackson was one of the first cases he was involved in when he joined the police. Now he must find who killed Aurora while navigating the muddy waters of being a contemporary of the six suspects, and of having known Aurora Jackson when she was still alive. Gytha Lodge’s debut novel introduces us to DCI Jonah Sheens and his team of investigators in what is probably best described as a text-book police procedural. As chapters alternate between present day from the point of view of Jonah and his team and the night of 22 July 1983 from the point of view of Aurora Jackson, we begin to build up a picture of the events that led to Aurora’s disappearance. As we progress through the story, each of the six friends who were with Aurora that night come under suspicion, as well as one outsider – a teacher on whom Aurora had a crush, who happened to be camping a couple of miles from the friends on the same night. The vast majority of the story takes place within the walls of a police station, as Sheens and his team sift through thirty-year-old evidence, and interview the suspects one by one. This is old-fashioned police work with no great jumps of deduction, or even much in the way of action, and yet it’s as gripping a mystery novel as you’re likely to encounter. As Sheens questions each of the suspects and we begin to put the events of the evening into some order – with the help of Aurora’s own point of view – we find that we, too, are part of the investigative team, and there’s a definite buzz in the thought that we might solve the crime before Sheens does. 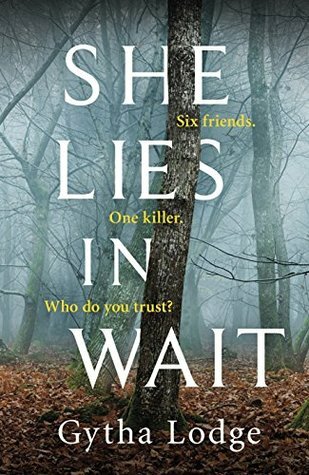 Less of a crime thriller, and more of a character study, an introspective piece that happens to have a mystery at its core, She Lies in Wait is the perfect antidote to the glut of fast-paced, high-tension crime thrillers of recent years. Intelligently constructed mystery and a compelling cast of characters, each with their own deep, dark secrets, combine to ensure that once you crack open that first page, and discover that first finger, you’re hooked for the duration, following along as each clue is revealed and the jigsaw begins to take shape. Sheens’ team are a close-knit group, each with a set of skills that complements the other members of the team. Sheens knows where his weaknesses lie and how to delegate most effectively to ensure he isn’t missing anything. Lodge ensures we’re not left on the outside by introducing us to the team through the eyes of DS Hanson, who has recently joined the small group. This gives us some insight into Sheens that we might not otherwise pick up from his point of view, while answering any questions we might have about the strange group dynamic. While the resolution to the mystery is reasonably straightforward – though not exactly predictable, by any means – it’s the journey that sets She Lies in Wait apart from other books in this genre. This is plodding police work made entertaining by involving the reader in the investigative process. This submersion into the story means that we don’t miss the car chases, or the monologues at gunpoint or the sinister snippets through the eyes of the murderer that we have come to expect from crime fiction for a quick blast of adrenaline. Lodge puts us behind a desk, plants us in the corner of the interview room, and gives is insight into the investigative processes of a methodical, if not exactly wholesome, detective. Smartly plotted and engagingly told, this is an excellent example of a grounded and well-researched police procedural. Sheens is an excellent new character on the crime fiction scene and I, for one, would love to see She Lies in Wait form the basis for a series. 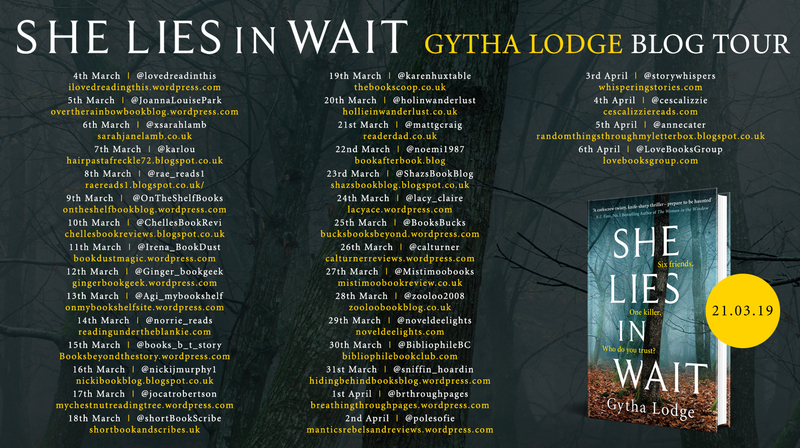 An unexpected read that gets under the reader’s skin, this debut puts Gytha Lodge on the map, and makes her one to watch in the future.